In 2007 I suddenly fell ill with chronic renal failure. On being told the news, my Christian mother and sister-in-law, and some Catholic friends all came to visit me to preach the gospel to me. They all told me that I only had to go to God and my illness would be cured. But I didn’t believe in God at all. I thought that illness could only be cured through scientific medical treatment, and that any disease that couldn’t be cured by science was incurable. After all, was there any power on earth greater than the power of science? Faith in God was just a form of psychological crutch, and I was an upstanding state school teacher, a person who was educated and cultured, so there was no way I’d start believing in God. So I turned them down and started looking around for medical treatment. Within a few years I’d been to virtually every large hospital in my home county and throughout the province, but my condition didn’t improve. In fact, it was getting worse, but I stubbornly clung to my own way of looking at the situation and insisted that science could change anything and that curing illness was just a question of finding the right process. In 2010 a sister from The Church of Almighty God came to preach the gospel of God’s kingdom to me. She said that the Lord Jesus had returned to the mundane world to do new work, which involved issuing truths to judge and cleanse people. This was a phase of God’s work designed to thoroughly save mankind, and was also mankind’s last chance to be saved by God. I still wasn’t willing to accept all this, but because of all the failures and frustration that I’d encountered over the previous few years seeking medical treatment my attitude wasn’t as unyielding as it had once been and I allowed myself to be persuaded to take a book of God’s words from the sister. But, at the time, I certainly didn’t believe that the stuff in the book was truths expressed by God. I still maintained that only science could change my fate, and thus continued to believe that only drugs could improve my condition. Eventually, I was ingesting more drugs every day than I was eating food, and yet my condition didn’t improve a jot. I lost count of the number of times the sister came to my home, but I still refused to believe in God. This went on for about a year. Then one day out of the blue my vision in both eyes went blurry and both of my legs became so numb that I couldn’t walk. The doctors diagnosed drug poisoning from all the years of taking large quantities of medicines. I first spent a week in the county hospital, was then transferred to a military hospital in Beijing where I was treated for a month, and finally ended up in a well-known traditional Chinese medicine hospital in Beijing to receive TCM treatment. But these 2 months of treatments did nothing to improve my condition. My primary doctor even asked the retired former head of the hospital’s neurology department to come and take a look at me, but there wasn’t the slightest improvement in my condition. Then I heard my future daughter-in-law mention a doctor in Yunnan who was famous for being able to treat difficult and complicated conditions like mine. After various twists and turns, I managed to be taken there in a wheelchair. But after being treated for nearly a month, not only wasn’t there any improvement in the problems with my eyes and legs but my kidneys were getting worse due to all the drugs I’d been taking. Feeling beyond help, and in great discomfort, I decided to go home. After that, I gave up all treatments and drugs for my eyes and legs in order to protect my kidneys. One day, my husband saw the book that the sister from The Church of Almighty God had left for me and opened it. He saw the following heading, “Do You Know? God Has Done a Great Thing Among Men,” which grabbed his attention. So he read out the following passage for me: “The work of God is that which you cannot comprehend. If you can neither grasp whether your decision is correct nor know whether the work of God can succeed, then why not try your luck and see whether this ordinary man is of great help to you, and whether God has done great work.” Hearing him read this sentence was like a jolt to my heart! Especially the bit “then why not try your luck,” which kept on reappearing in my mind. It was like a shaft of light shining on the deathly stillness in my heart, and it seemed that I could see a glimmer of hope of staying alive. I urgently made my husband read out another 2 passages of God’s words, which contained truths about God using His word to judge and cleanse people and transform their life dispositions. All this was completely new to me, and even though I didn’t really understand the full significance of what was being said, I could feel in my heart that these teachings were different from the gospel of the Lord Jesus that I’d heard from other people. They had mostly told me about how to gain grace, and that all I needed to do was believe in God and my illness would be cured, which I didn’t believe. But the words of Almighty God seemed much more practical, and the more I heard the more I wanted to hear. After that, I allowed my husband to read some of God’s words to me every day. In the book it said that religious people believe in God but don’t know God and even resist God, and that they often commit sins in the daytime and confess them at night. All this increased my faith in God even more because my mother, and two sisters-in-law were all Christians and the way they lived was just like God’s words described. They really did commit sins and then confess them and then commit them again. 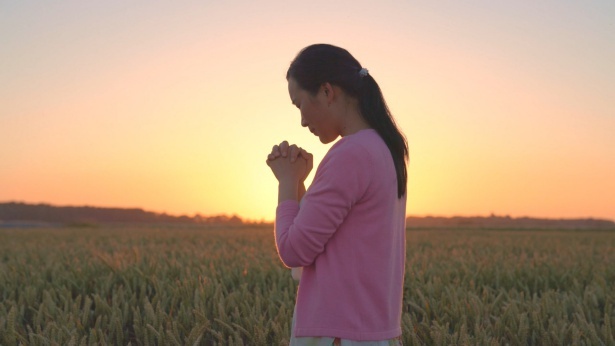 That’s when I had a spiritual awakening: Is this really God’s voice? If it’s not God, then how come the author knows the religious world so well? Unbelievers don’t know it, the great and famous are also not clued up about it, and even religious people themselves don’t realize that they believe in God but also resist God. The more I thought about it the more I felt that the words in the book were not things that people could express, and that they probably were the utterances of the incarnation of God in the mundane world. Only a few days later, the sister who had originally preached the gospel of Almighty God’s kingdom to me heard that I was back at home after being in hospital and came over to my house, accompanied by another sister, to preach the gospel to me again. This time I was aware of the voice of my conscience telling me: “I’m already an invalid but the sisters haven’t abandoned me in disgust and have even come to preach the gospel to me again. Being able to stick with me like this is something that ordinary people wouldn’t be able to do. Anyone else would have forgotten about me long ago.” In my mind it was very clear that this kind of love comes from God, as it can never be found in the mundane world. As the saying goes, “A friend in need is a friend indeed,” and that day I experienced this profoundly. That my family stayed by my side was something that they couldn’t avoid, but to have these people who were totally unrelated to me, who had no ulterior motives or conditions, to come regularly for over a year to preach the gospel to me, to put themselves out for an invalid like me, showed how amazing their faith and love and patience really was! I was truly moved by God’s love, and from then on had no reason to refuse God’s gospel anymore. As a result, my husband and I both accepted God’s work of the last days. In June 2011 my husband and I formally began our life in The Church of Almighty God. Because my eyesight isn’t good enough to allow me to read my husband usually reads out God’s words to me, and during church meetings the brothers and sisters also read God’s words to me. Sometimes when I’m by myself I’ll also listen to hymns. Later, I found the reason for my illness and suffering in God’s words: “After Satan’s corruption, man became more and more degenerate, the illnesses of man were deepened, and their suffering became more and more severe. Man felt more and more the emptiness, the tragedy and the inability to go on living of the world, and they felt less and less hope for the world. So this suffering was brought on man by Satan, and it only came after man had been corrupted by Satan and man’s flesh became degenerate. … So it is still possible for you to have illnesses, troubles and to feel suicidal, at times also feeling the desolation of the world, or that life has no meaning. That is to say, this suffering is still under Satan’s mastery—this is a fatal weakness of man” (“The Meaning of God’s Experiencing the Pain of the World” in Records of Christ’s Talks). God’s words are spot on in describing how I suffered so much with the pain of illness that I lost all the will to live and wanted to end my life. But God’s words said that all that pain of illness and suffering was due to Satan’s harmful ways. At first, I didn’t really understand why God said these things, but after reading God’s words I gradually came to understand these truths. One afternoon my husband was reading God’s words to me as usual, and I heard these words of God: “From when man first had social sciences, the mind of man was occupied by science and knowledge. Then science and knowledge became tools for the ruling of mankind, and there was no longer sufficient room for man to worship God, and no more favorable conditions for the worship of God. The position of God sunk ever lower in the heart of man. A world in man’s heart with no place for God is dark, empty without hope. … Science, knowledge, freedom, democracy, leisure, comfort, these are but a temporary respite. Even with these things, man will inevitably sin and bemoan the injustices of society. These things cannot restrain man’s craving and desire to explore. Because man was made by God and the senseless sacrifices and explorations of man can only lead to more distress. Man will exist in a constant state of fear, will not know how to face the future of mankind, or how to face the path that lies ahead. Man will even come to fear science and knowledge, and fear even more the feeling of emptiness within him” (“God Presides Over the Fate of All Mankind” in The Word Appears in the Flesh). It was when I heard these words that I finally understood why God said that all of mankind’s illnesses and suffering originate with Satan: Satan uses knowledge and science to corrupt us. Satan fills us up with its absurd ideas, such as “Humans evolved from apes,” “There has never been any Savior,” “Knowledge can change people’s fates,” “Your fate is in your own hands,” “Science saves people,” and “Man can conquer nature.” Satan has brainwashed mankind with these philosophies, rules, ideas and views. They have occupied people’s hearts, and force people to have blind faith in knowledge and to worship science. People have the delusion that they can change their fates with knowledge or employ science to solve every difficult problem. People have taken Satan’s absurd ideas to form the basis of their lives, and have thus been taken prisoner, bound, and restricted by Satan. People have started to deny all that comes from God, to move far away from God’s care and protection. Satan is manipulating them like a puppeteer playing with his puppets, and I was just one of the many millions being harmed in this way. When I was ill, I relied on science to treat me; I believed in science and I worshiped science. I really thought that the specialists in the famous hospitals, with their advanced techniques and modern medical facilities, would be able to cure my illness. But not only didn’t my condition get better I actually ended up close to death. The only things science brought me were dream-like hope and pain that could never be redeemed. Science caused me to not believe in God, and so time and time again I rebelled against God, resisted Him, and refused His salvation. But although I was rebellious, God never gave up on my salvation, and has since used His words to guide me and, little by little, wake up this heart of mine that has been smothered by knowledge and science. A person who was once close to death has now come before God and gained God’s salvation. My husband continued to read God’s words to me every day, and one day I heard these words of God: “God created this world, He created this mankind, and moreover He was the architect of ancient Greek culture and human civilization. Only God consoles this mankind, and only God cares for this mankind night and day. Human development and progress is inseparable from the sovereignty of God, and the history and future of mankind are inextricable from the designs of God. … If mankind wishes to have a good fate, if a country wishes to have a good fate, then man must bow down to God in worship, repent and confess before God, or else the fate and destination of man will unavoidably end in catastrophe” (“God Presides Over the Fate of All Mankind” in The Word Appears in the Flesh). From listening to this passage I realized that the fate of everyone is in God’s hands and that God is the source of human life. Only by coming before God, following God, and worshiping God can people have good destinies. If people move away from God, resist and abandon God and instead rely on Satan, then that is like handing themselves over to Satan. As a result, they will be harmed and trampled on by Satan, and will experience endless disasters and limitless suffering. This is how people harm themselves and bring about their own demise. At that moment, I realized just how foolish, blind, and pitiful I’d been. I saw that my views on knowledge and science were all just poison, or were a tool for Satan to corrupt me with. All these years I was being poisoned by the devil, and now I regretted it immensely. From the bottom of my heart, a true desire to be like the people of Nineveh in the Bible welled up. I wanted to throw myself on the ground in front of God and confess and repent. I wanted to leave behind all my evil ways and accept the leadership and sustenance that God provided. I wanted to follow God and worship Him, and so I actively requested some hosting duties in the church. In my interactions with the brothers and sisters nobody looked down on me or disparaged me because of my illness. In fact, they gave me a huge amount of help and support and I always felt that I was surrounded by their sincere love. Following the sisters’ fellowshiping I came to understand that just enjoying God’s grace is not enough to change our satanic dispositions. Only by accepting God’s judgment and chastisement work of the last days can we rid ourselves of our corrupt dispositions, return to the perfect conscience and rationality that we had when God created us, and thus attain God’s salvation and become compatible with His will. All those Christians who don’t accept God’s work of the last days might well get God’s abundant grace, but they still live in a state of committing sins and confessing sins. That’s because their corrupt dispositions haven’t been cleansed, and so all of their running around and expenditures are for gaining God’s blessings and grace. In other words, they want to do deals with God and that means they’ll never gain His approval. After I understood God’s will, I stopped requesting God to cure my illness and instead made the firm commitment to believe in God and worship God no matter how good or bad my condition was. I committed myself to fulfilling my duties as one of the created, to seeking truths and knowing God more earnestly, to ridding myself of my corrupt dispositions, and to living like a true human being in order to satisfy God. Once I started putting all this into practice, I felt great release in my heart and no longer felt bound or restricted by the pain of my illness, and was no longer so afraid of death. All I wished for is to completely hand myself over to God and obey His dictates and arrangements. After that I continued to frequently get together with the brothers and sisters to read God’s words, fellowship truths, and sing hymns of praise to God. As a result, I felt that my spiritual life became much more substantial and that my pain started to diminish. Even more mysterious was that, almost without knowing it, the numbness in my legs started to fade and I slowly began to regain the ability to walk, eventually not having to rely on a wheelchair at all. What was even more unexpected was that one day my vision suddenly returned and I was able to see the words printed in the book of God’s words. I could finally see God’s words! I couldn’t believe it, but a miracle really had happened to me. The joy that I felt in my heart was something indescribable, but it made my heart burst with prayers of gratitude and praise for God. I excitedly told my husband the good news, and he was overcome with emotion. With tears in his eyes, the words “thank You God, thank You God!” involuntarily tumbled out of his mouth. Yes, it’s true—I only had a little bit of submission to God, but God bestowed this great blessing on me. I felt very deeply how even though God’s work of the last days doesn’t involve manifesting miracles, the authority in God’s word far surpasses the authority of God’s miracles. God really is the almighty God, the God who loves people! Nowadays I live a normal life. My relatives, friends, and neighbors always express their surprise and say things like: “I never thought that your condition would improve so quickly. Physically and mentally you seem like a normal person!” Every time I hear something like this I say a few silent words of gratitude to God: “I will never forget, my whole life, the love You have shown me and Your salvation. Although there’s nothing I can do for You at least I will follow You, worship You and do my duty as one of Your created beings for the rest of my life to repay Your love.” Although my illness wasn’t completely cured, I knew that I’d been deeply corrupted by Satan and that I still had many corrupt dispositions and so I still needed a lot of God’s judgment and chastisement to transform me. I’d been deeply corrupted, I originally hadn’t recognized the existence of God, and time after time I’d refused God’s salvation, but not only did God not hold my sins against me He even carried out a great salvation on me. I have gained an immense amount of God’s mercy, and I know I’m totally unworthy of such grace. These powerful and abiding experiences have shown me that science and knowledge can’t save people, but will only bring people unending suffering, fear, and death. Only the Creator and Ruler of everything in the universe can give humans life and the sustenance that they need. God is the only foundation of the survival of mankind, and is mankind’s only hope and redemption. People’s only hope of having a good destiny is to worship God. I thank God for saving me—a person who was deeply hoodwinked by Satan and was close to death—from Satan’s domain. God brought me back to life and brought me back before Him, the Creator of all things. I now walk on the brightly-lit path of life. All glory to Almighty God! Previous Previous post: Buddhists and Taoists have religious practices wherein they separate themselves from worldly affairs and practice asceticism, can that achieve salvation?